Do you like to Decorate Easter Eggs? Here are 7 Unique Ways to Decorate Easter Eggs that is so much more than simply dipping them in dye with vinegar. Simply click the title below the image to get to the craft tutorial. 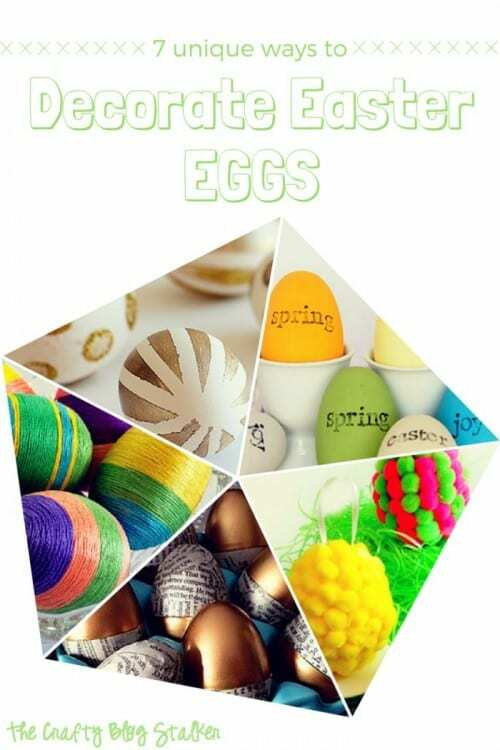 7 Unique Ways to Decorate Easter Eggs is an easy DIY craft tutorial idea. Don't just dip them in dye, decorate them! How do you decorate your Easter Eggs? Share and leave a comment below! SAVE 7 UNIQUE WAYS TO DECORATE EASTER EGGS TO YOUR FAVORITE EASTER PINTEREST BOARD! Hi Katie! Thank you SO much for featuring my pompom eggs and the Gemhead Egg Girls! You made my weekend! Have a happy Sunday and a fabulous week! Thanks for featuring my gold & newspaper decorated eggs. Really easy DIY! And I love all your other picks too!! Thanks for sharing! Katie, great roundup here! Thank you for sharing with us at Brag About It! Hope you’ll link up with us again next week! What fun new ideas to try with EAster eggs! So many cute projects, so little time 🙂 I wish I could make them all. Love the embroidery ones and the gold dipped ones! So cute! Those are wonderful! The gem head ones made me laugh. I really like the string ones. I thought the gem heads were super cute too! Thanks Shecki! Oh my gosh, these are ALL adorable! Thank you Marie! I thought so too. There really are so many ways to decorate an egg!